� Hochevar has partnered with an indoor Olympian (Logan Tom), four beach Olympians (Holly McPeak, Nicole Branagh, Misty May-Treanor and Lauren Fendrick), and with Kerri Walsh Jennings (indoor and two-time beach Olympian). � Less than a week after Hochevar posted her career best (at the time) with a fifth-place finish in Cincinnati in 2007, her younger brother Luke was called up to the major leagues. 2018: Hochevar formed a partnership with Kelly Claes, and they played in six AVP tournaments. The pair advanced to the semifinals each time, with a best of second once. Hochevar ranked fifth on the AVP Tour in aces (.93 per set). On the FIVB Tour Hochevar played three times with Emily Day with a best of ninth. She then teamed up with Claes for seven events. In their first tournament together Hochevar and Claes advanced from the qualifier to reach the gold medal match. The duo advanced to one other semifinal but lost in the bronze medal match. 2017: Hochevar and Emily Day played in six AVP tournaments, winning three of them, the only team to win multiple titles that year. Hochevar was fifth in kills (6.83 per set), eighth in digs (5.21 per set), 10th in aces (.67 per set) and 10th in hitting percentage (.453) on the AVP. Hochevar and Day played seven times on the FIVB Tour, with a best of fifth. 2016: Hochevar began the AVP season with Fopma, placing second and third in their two events together. She then played twice with Emily Day, finishing third before winning the Manhattan Beach Open. Hochevar ended the year playing alongside Kristin Hildebrand. Hchevar ranked sixth in kills (6.83 per set), ninth in digs (5.20 per set) and 10th in hitting percentage (.453). On the FIVB Tour Hochevar played 10 times, nine of those with Fopma, getting a best of ninth two times. 2015: Hochevar played two AVP events alongside Misty May-Treanor, finishing third in each. Internationally Hochevar and Heather McGuire teamed up for seven events, with a best of ninth. She also played three times with Jennifer Fopma, also getting a best of ninth. 2014: Hochevar began the season playing with Lane Carico, placing third in each of their two AVP events together and a best of 17th in four FIVB tournaments. Fendrick finished the remainder of the AVP season with Ali McColloch, getting a best of third once. She finished sixth on the tour in aces, with .76 per game. Hochevar ended the year competing twice on the FIVB Tour with Heather McGuire and once with Emily Day, with a best of ninth. 2013: Hochevar reunited with Fendrick for the first time since 2007, and the duo advanced to six semifinals in seven tournaments, placing second in both the season opener and finale. They were the top-ranked team on the tour in terms of points. Hochevar was third in hitting percentage (.465). On the FIVB Tour, Hochevar opened the season playing once each with Summer Ross and Emily Day. She and Fendrick had a best of fifth three times in their nine FIVB events together, including in the World Championships in Poland. 2012: Hochevar formed a partnership with Angie Akers. The duo played in 10 FIVB events with a best of 17th. Hochevar finished the season with a tournament with Emily Day, placing 13th. Domestically Hochevar and Akers had a best of third in their four events, while she also placed third in her only domestic tournament with Branagh. 2011: Hochevar reunited with Fopma to compete internationally, progressing from country quota to qualifier to main draw (Hochevar's first ever) in their first three events. In Myslowice, Hochevar partnered with Kerri Walsh for the first time, and the duo advanced from the qualifier to place seventh. Hochevar teamed with Lisa Rutledge for seven tournaments, with a best of ninth, before concluding the season with a ninth with Nicole Branagh. Domestically Hochevar played three events with Rutledge, winning once, and one tournament with Branagh. 2010: Hochevar formed a partnership with Dianne DeNecochea, and they advanced to the finals in just their second event together in Santa Barbara after upsetting the top two seeds. The duo played all seven AVP events together, finishing as the sixth-ranked team. Hochevar competed in two FIVB country quota matches at the end of the year, playing alongside Jaimi Gregory. 2009: Hochevar continued her partnership with Fopma, logging 12 top-10 finishes in 14 AVP events. In Brooklyn the pair won three straight contender's matches to advance to the finals, the first for both players. 2008: Began the season with Burdine, getting a best of ninth in four events. Switched partners to Jennifer Fopma and the duo's best finish was a seventh in Long Beach after advancing from the qualifier, Hochevar's first qualifier since 2005. 2007: Played the first seven events with Lauren Fendrick, with a best of seventh. Partnered the rest of the season with Keao Burdine with the exception of two events with Holly McPeak. In her final event of the year, Hochevar placed fifth in Cincinnati with Burdine to establish a career best. She ranked fifth in aces per game (.92). 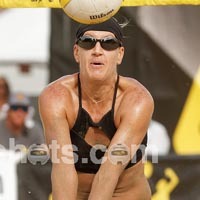 2006: Played one event with Angie Akers, then four events with Logan Tom in her inaugural pro beach events. She had a best of 13th with each partner. 2005: Hochevar began the season playing in four qualifiers with two different partners. For the next three qualifiers she partnered with Kimberly Coleman, and she advanced to her first two main draws, including Manhattan Beach. In her final event, she played with Paula Roca, and the duo placed seventh. 2004: Made her pro beach volleyball debut in Chicago, but failed to advance from the qualifier. College: As a freshman, Hochevar replaced Misty May at LBSU at setter. She was a three-time all-Big West honoree, and a second-team All-American her senior season. Showed her versatility by leaving LBSU ranked in the top 10 in career aces, assists, digs and block assists. She also was selected to the 2002 Verizon Academic All-District team, and graduated with a degree in Broadcast Journalism and Marketing. Personal: Hochevar was the alternate for the 2004 Olympic team, and played professionally in Puerto Rico. Her dad, Brian, played for the Denver Nuggets and coached college baseball and her mom, Carmen, played Division II volleyball and basketball at Southern Colorado. She has two brothers, Luke and Dylan, a three-sport high school athlete. Luke, a pitcher formerly on the University of Tennessee baseball team and the No. 1 overall pick in the 2006 First-Year Player Draft, made his major league debut on September 8, 2007 with the Kansas City Royals.